I have so many great pictures from this week that I feel like I need to do two or three PhotoEssays. Or perhaps I should just plan to write a couple more posts for next week? That might be a plan…especially since I’ve been struggling to get something posted on Mondays this year. Here’s the whole garden picture from this week, but from the other side of the garden today. 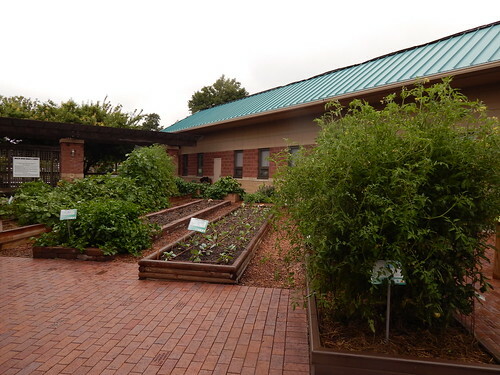 The trellis and sweet potatoes are really impressive, but the tomatoes are equally crazy! We had the hardest time getting the cucumber vine started on the trellis this spring when there wasn’t much moisture. After replanting multiple times, we finally had one seed germinate, and it is just now producing. 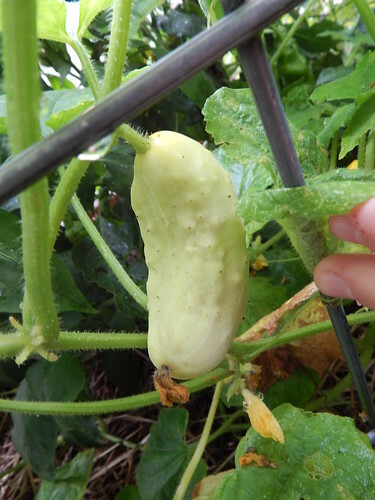 It is one of the ‘Salt & Pepper’ Cucumbers that we had last year. 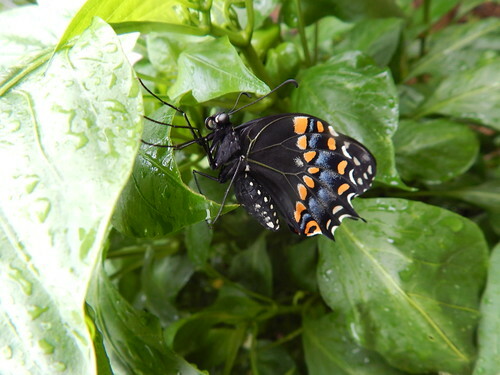 After having caterpillars munching on herbs for the last several weeks, it looks like we’re starting to see some butterflies! 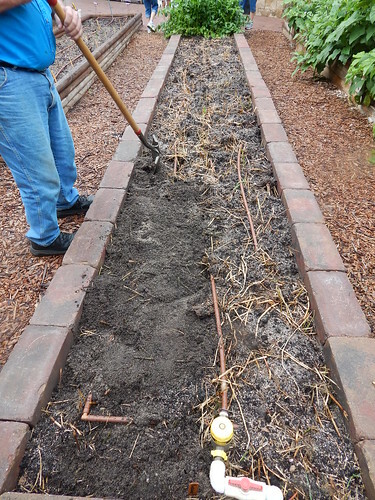 We turned the soil in this bed again to keep working in the remnants of the crazy buckwheat. It looks much cleaner after that second turning. 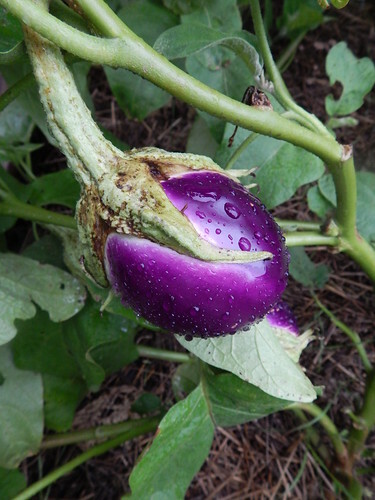 Hmm…this ‘Rosa Bianca’ eggplant seems to be more purple than rose. I wonder if the color is an effect of the cooler night temperatures? It’s certainly pretty, and I’m sure there is no effect on the edibility. It’s just interesting that the colors are so much more vibrant all of a sudden. 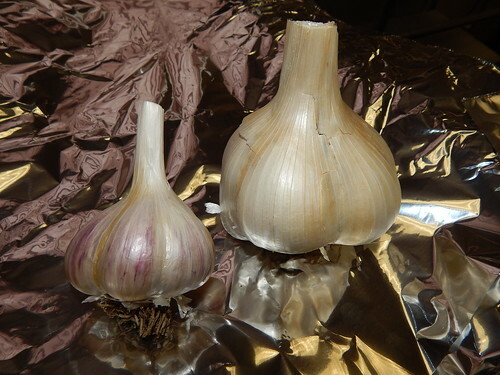 The ones I picked at the beginning of the week were almost white. 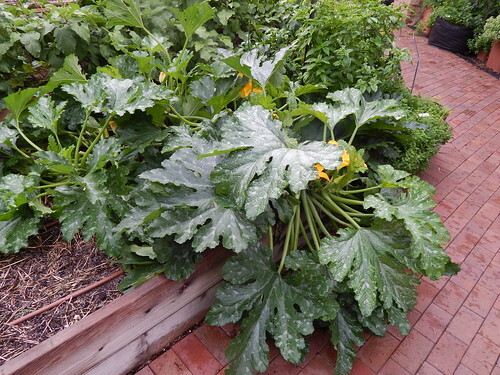 Posted on August 16, 2013, in PhotoEssays and tagged butterflies, cucumbers, eggplant, insects, melons, squash, Tomatoes. Bookmark the permalink. Leave a comment.